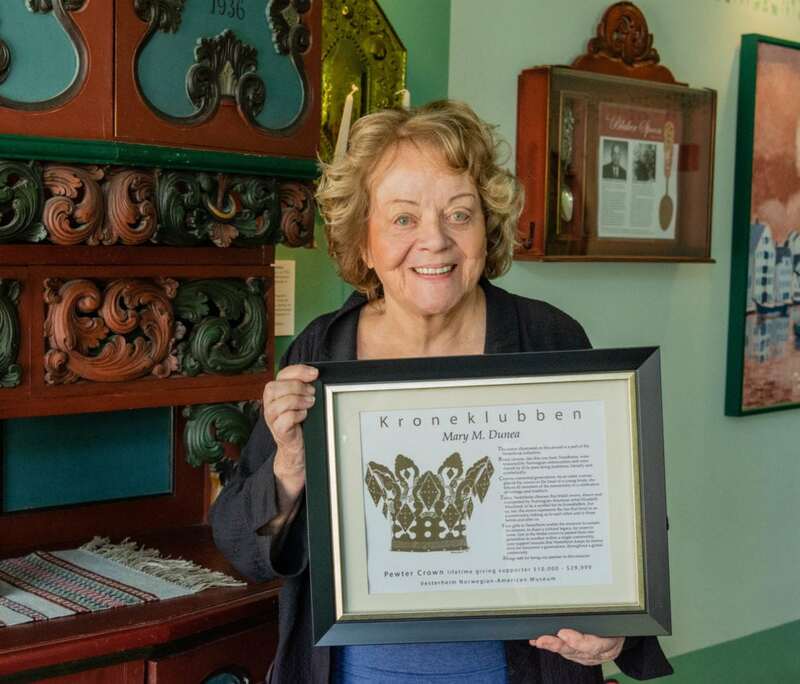 While Mary Dunea from Osage, Iowa, visited us at Vesterheim this month, we took the opportunity to honor her with a pewter Kroneklubben award. Mary has been an active supporter and member of Vesterheim since 2010, sponsoring Norwegian by Design, Vesterheim Magazine, Vol. 11, No. 2, 2013. She also helped sponsor Restored Connections, a traveling exhibition from Norway on view at Vesterheim in 2014 and 2015. And she has given many Vesterheim gift memberships to friends and family. Mary loves to travel and she has been all over the world, including to Norway. She loves coming to Decorah, especially shopping in Vesterheim’s Museum Store. Thank you, Mary, for all of your support over the years! Find out more about Vesterheim’s Kroneklubben awards here.